Awasu Design in San Francisco is looking for a talented Content Strategist to help round out their service offerings. They are a top-flight, user-centered consultancy with a strong reputation, good clients, and a great work atmosphere. See anything missing from that list? 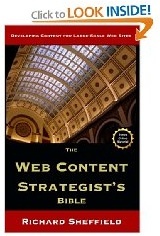 Help them add Content Strategy and content development to that list of capabilities. Great job, great clients, great city... seems worth checking out.